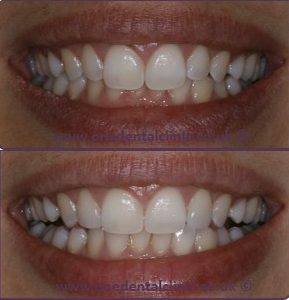 Lumineers are a special type of porcelain veneer that can only be be prepared specifically for the Cerinate Smile Design Studio. They are made with a porcelain and are thinner than other veneers, but still remain strong and durable. Are Lumineers Right For Me? Most veneer treatments require preparation of the tooth before the placement of the veneer. This invasive technique is not always beneficial to the tooth. It actually removes a very sensitive and protective layer off your tooth. This procedure is non-reversible. With Lumineers, there is most often no need to conduct any initial preparation or tooth filing. For some, the pain of these initial preparations can be unbearable and most people require anaesthesia. If you are looking for relief from stubborn stains, cracks or chips, but are too afraid of the pain that may be involved or are hesitant about the time it will take, Lumineers are the veneers to invest in. How Long Is The Lumineers Procedure? As minimal to no preparation is required, you can be fitted for Lumineers within two to three visits. The first visit is always a consultation where the dentist will assess the extent of damage to your teeth. You will be given detailed information about the procedure and the materials we are going to use. We like to give our patients time to think about their options. If you believe Lumineers is the best option for you, we will book you in for a second visit. This patients small lateral incisors made her front two teeth appear too big for her mouth. 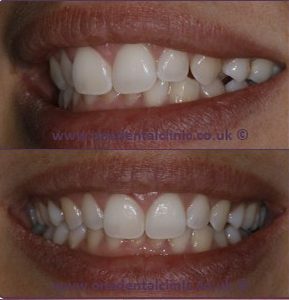 We used two ultra-thin lumineers to create an even smile. Which Lumineer/Veneer treatment is suitable for me? There are many types of veneers available in modern dentistry that it can be difficult to decide on your own what type of veneer you require. The first and foremost important step is the assessment of your damage and determining which type of veneer can repair it. You must speak to us and ask any questions you may have to help decide if this is the treatment for you. We will tell you what the best options available to you are and will happily go into more detail of each option. Book a free consultation today to get started on uncovering that beautiful smile!